University of Texas Longhorns watched the game slip away early and couldn’t recover in a 9-1 loss to Texas State on Saturday. Texas State took the lead on a single in the first inning. 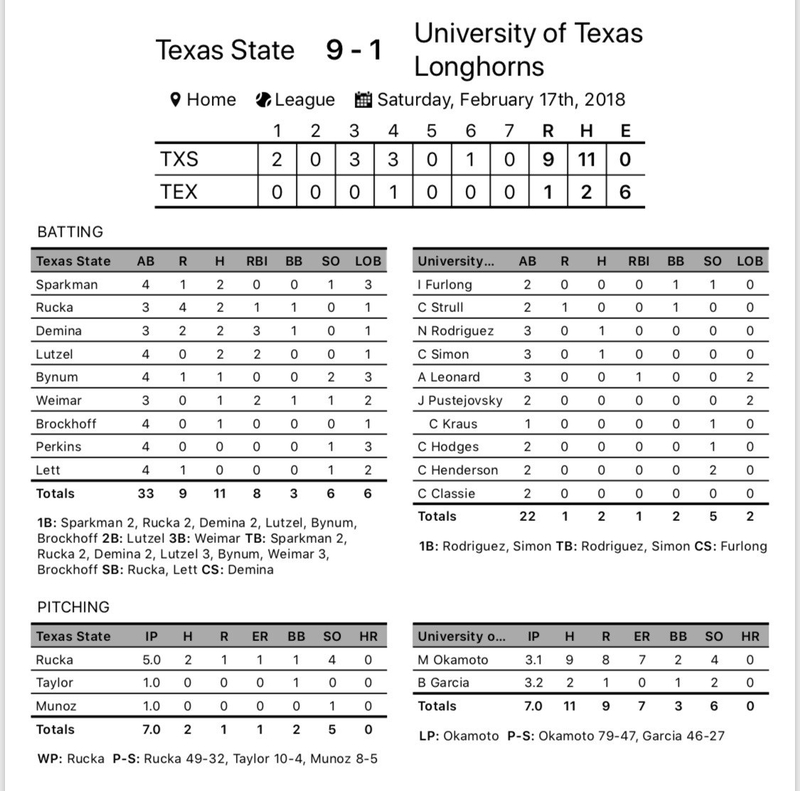 The University of Texas Longhorns struggled to put runs on the board and had a tough time defensively containing Texas State, giving up nine runs. Texas State got on the board in the first inning. Demina singled on a 2-2 count, scoring two runs. Texas State scored three runs in the fourth inning. Texas State’s big inning was driven by singles by Rucka and Demina and a double by Lutzel. Rucka earned the win for Texas State. He allowed two hits and one run over five innings, striking out four and walking one. Taylor and Munoz entered the game out of the bullpen and helped to close out the game in relief. Miles Okamoto took the loss for University of Texas Longhorns. He allowed nine hits and eight runs over three and a third innings, striking out four. Chris Simon and Nick Rodriguez each managed one hit to lead University of Texas Longhorns. Texas State racked up 11 hits on the day. Rucka, Demina, Sparkman, and Lutzel all had multiple hits for Texas State. Texas State didn’t commit a single error in the field. Bynum had the most chances in the field with five.